Special is valid from 13th March 2019 to 31st May 2019. - Full Day Abu Dhabi City Tour with 1 hours Yacht Cruise in Yas# - Explore the sights and landmarks of Abu Dhabi, the capital of the United Arab Emirates on a full day tour with pickup and drop-off from your hotel in Dubai. This tour takes in all of the capital's sights. Visit and tour the spectacular Sheikh Zayed Grand Mosque - an Abu Dhabi must-do visit. Drive through the city and along the Abu Dhabi Corniche. Share a 01 hour yacht cruise in Yas Island. - Full Day London in One Day with Changing of the Guard and River Cruise# - The tour begins with a panoramic drive around Parliament Square to see the magnificent Westminster Abbey, where Prince William and Kate Middleton were married. To Kensington Palace, former home of Diana, Princess of Wales. We'll see the Royal Albert Hall and Albert Memorial. We head to St James' Park and Buckingham Palace to see the colourful ceremony of the Changing of the Guard. Accompanied by a military band. Then have a chance to enjoy lunch at a traditional London Pub. We take you on a guided tour of St Paul's Cathedral, Sir Christopher Wren's masterpiece with its magnificent dome. The Cathedral was rebuilt after the Great Fire of London in 1666. In recent years it has seen the wedding of Charles, Prince of Wales, to Lady Diana Spencer and, more recently, the thanksgiving services for both the Diamond Jubilee and 80th Birthday of Her Majesty the Queen. Climb 259 steps up the dome and you will find The Whispering Gallery, which runs around the interior of the Dome. Finally on to the Tower of London, one of the world's most famous and spectacular fortresses. Over the past 1000 years it has been a Royal Palace, an armoury and a place of imprisonment and execution. The Beefeaters who guard the Tower will regale you with stories of its past. We will visit the Crown Jewels, including the magnificent solid-gold crown used at the coronation of Queen Elizabeth II, the enormous Cullinan diamonds and the extraordinary Koh-I-Noor. *Conditions Apply: Prices are per person, capacity controlled and listed in Australian dollars twin share including port taxes. Prices may fluctuate if surcharges, fees, taxes or currency change, and may be withdrawn at any time. Prices shown here are not shown in real time. While we endeavour to keep our pricing as up-to-date as possible, the advertised prices shown here may differ from the live prices in our booking system. The prices shown are for a cash payment. Credit card fees of up to 2.5% will apply. Offer correct as at 13Mar19 and subject to live availability at time of booking. Prices are per person twin share based on best available cruise fare, inclusive of all discounts unless otherwise stated. All offers are capacity controlled and can be withdrawn or modified at any time without notice and subject to availability at time of booking. Outside and Balcony cabins may have obstructed views and Suite cabins comprises Junior Suites, Mini Suites and any other type of suite that represents the best value for each cruise. Unless otherwise stated, onboard gratuities are NOT included. ~Specialty restaurants may incur a surcharge. #Airfare, hotels and tour prices are based on 2019 prices and as such subject to change until bookable at approximately the end of May 2020. These fares/prices may change due to availability or currency fluctuations and all prices listed here are best considered `guestimates` except for cruise prices/offers. ^Onboard credits are a total per twin, triple or quad stateroom, vary by voyage duration and are not applicable with all fare types. Singles get half. Bonus onboard credit is non-refundable, not transferable and cannot be redeemed for cash. Onboard credit can be spent on shore excursions, restaurants, drinks, spa and in the shops onboard. Bonus Onboard Credit offer is subject to the discretion of Cunard Cruises and may be withdrawn at any time without prior notice. Please refer to the Terms and Conditions contained in the latest Cunard brochure. All passports, vaccinations and visas are the responsibility of the travelling guest to secure prior to departure from Australia. Some cruise lines reserve the right to impose a fuel levy if the NMEX price reaches a certain level - please check with your consultant at time of booking. Cruise deposit, amendment and cancellation conditions apply. Travel agent service fees not included. Special conditions apply - please ask for full details at time of enquiry. Offer ends 31May19 or until sold out/withdrawn from sale. Please note only residents with an Australian address are eligible to book Australian rates in Australian dollars. This cruise package is provided by Seven Oceans Cruising, please ask your travel agent to contact us for more information. 21 Night World Cruise sector sailing from Dubai to Southampton aboard Queen Mary 2. Lavish Dubai and colourful Oman embody the intrigue of the Arabian Gulf. 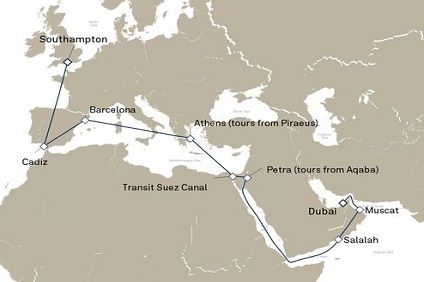 Transit the historic Suez Canal and enjoy time ashore in Athens, Barcelona and Seville, before your last call in Southampton. Dubai is full of fascinating contrasts and distinctive blends. Here you’ll uncover Eastern and Western influences, extraordinary extravagance, stunning man-made resorts, and a culture that intrigues. Beyond the endless shopping opportunities, there are memorable sights at every turn, including Jumeira Mosque, the glittering Gold Souq, and the Heritage Village showcasing Bedouin craftsmanship. In this low-rise gem between the Arabian Gulf and scenic mountains, your first impression will likely be from the Sultanate of Oman’s beautiful main palace, but there is a great deal more to Muscat. Forts Mutrah, Jalali and Mirani guard Muscat’s entrance, and once ashore you’ll wonder which direction to explore in. Maybe start with the pink marble Zawawi Mosque and its gilded dome. From Piraeus, you visit Athens – the world famous ‘birthplace of modern democracy’. This is a magnificent opportunity to explore its universal legacy of architectural, artistic and political triumphs. Visit the perfectly proportioned Parthenon built during the Golden Age of Peracles, stroll the ancient columns of Stoa where Plato once lectured, or tour the tavernas and twisting lanes of the Plaka. Delve into the Picasso Museum or Miró Foundation. Take in Gaudi’s rare architectural genius with Parc Güell, Casa Mila and Casa Batlló – and his incredible unfinished masterpiece, the Sagrada Familia. Post-sightseeing, take a shady spot in one of Barcelona’s numerous cafés for a dose of Las Ramblas’ charming evening atmosphere of street performers and social city life. The ideal start or ending point for a memorable voyage, the United Kingdom's premier passenger port and sprawling South Coast city, Southampton, was home to iconic transatlantic liners of yesteryear. Its great location means you’ve access to a range of historic sites, charming villages and national landmarks, and the great metropolis of London with all to see and do there.